Sore Eros (why does that sound dirty?) is a recent addition to the Blackburn Recordings label who just put out this single from Robert Robinson, the driving force behind this psyche-folk project. The thing is... these tracks should be soothing - even comforting, the layers of subtle washes of plucked melodies on acoustic guitar are calm, the slow tempo kind of lulls you into a brief hypnosis, but the vocals are completely unsettling. Maybe it's that they're a little too delicate...they sound like they're about to break at any moment... just cracking slightly off key. Robert's breathy, daydream delivery is mic'd super close and he's straining to push out a lyric, but the whole track is sitting on top of him. It manages to be a bit of a children's song, its managing to keep a structure while it's slowly falling apart. The A-Side 'Taal Compass', keeps a monolithic haze going without a repeatable direction. The weird part is how interesting this way of thinking is, I mean literally you are directly listening to someone who does not conventionally put melodies together. Exactly like Gary and Ariel...I wouldn't have thought this kind of unique songwriting was happening in so many places...it's just unrecognizable. Right towards the end of 'Taal Compass' there's a simple electric guitar line that for a second actually sounds like a moment on an old pavement single. I'm thinking about how much this is kind of related...a different time and place they might be on the same bill...as a laid back more psychedelic strain of the goofy indie rock. Now here's a generalization for you, there are a few guys I would say working in this style of wall-of-psyche-folk-sound: Woods, Gary War...even the Fresh and Only's...I think it's pretty closely related to the shoegaze scene in the 90's, not in style but content...and attack. I think the elements are there, the energy, the intense layering....minus the earsplitting volume. It's a negative approach to songwriting; take everything in dense layers, actually use all 24 tracks and then start stripping away the central part of the melody to get at an entirely new unexpected direction of the song....of course leaving room for the essential part of the whole thing...that your brain fills in the blanks between that static and hiss in ways you couldn't even play...and are completely personal. I think it says a lot that Gary War lent his synth work on the B-Side track 'Wide Open', I know it got me to track this down. Wide Open is even more freeform than the A-Side, lots of heady electronics, and vocals that are merely a heavily echoed arrangement of sounds really...just oh's and ah's. This single depends on what your goal is: to be challenged by something that isn't obviously gunning to kick out the party jams. 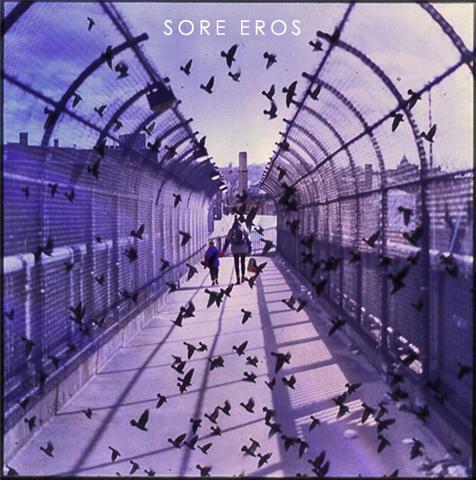 Psych-pop masters Sore Eros return with a brand new single on Blackburn! Both “Taal Compass” and b-side “Wide Open” (which features space age post-punk hero Gary War on synths) are slow burners that reveal an understated majesty, but their style and execution suggest wildly different mindsets. The title track is plaintive, with songwriter and lead man Robert Robinson’s vocals emerging organically from the analog distortion that coats the song. Flip the record over for an atmospheric epic that builds gracefully to an overwhelming crescendo that certainly earns the name “Wide Open." Get it from Blackburn Recordings. What kind of an angry god is paypal, that I am forced to appease him almost daily? Just want to also let you know about another review of a 12"er by The Late Virginia Summers I posted in the forum...it's a really great full length of instrumental intellectual rock. Can't wait for the vinyl to fianally be pressed. Get in on it before the 100 copies are spoken for. This band makes MY eros sore.